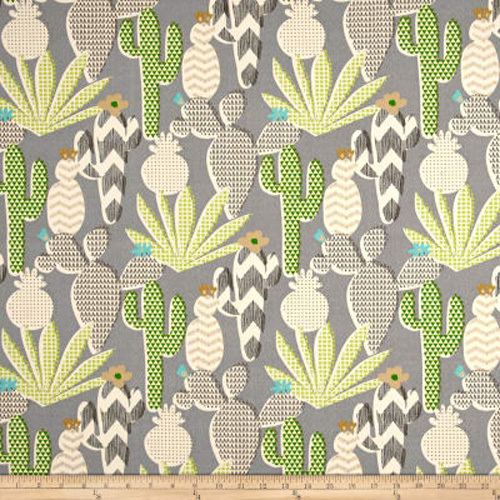 Waverly Cute Cactus Agave outdoor fabric. Colors include shades of green like kiwi, ivory, shades of taupe, brown, black, and aqua on a light grey background. Waverly’s Sun N Shade outdoor fabrics are the perfect choice for covering cushions on furniture used by the pool and for upholstering patio pieces that are exposed to the elements. Printed on durable, easy care 100% polyester fabric, they easily meet the rugged demands of casual outdoor living. The breathable textiles can withstand exposure to harsh sunlight, as well as resist mold, mildew, soil and stains. When accidents happen, spilled food or drink is quickly cleaned with soap and water.